Power. Speed. Productivity.The Formula for Success. Introducing the DocuPrint C5005 d, an advanced S-LED (Self-Scanning Light Emitting Diode) printer that delivers outstanding print quality with unmatched reliability – precisely what your business needs to maintain a competitive edge in today’s fast-paced market environment. With a wide range of input and output options, the DocuPrint C5005 d can be easily customised to meet your specific business requirements. With the wide array of options available on this printer, it is exactly what you need to keep up with the demands of today’s competitive market. The data being transmitted via network is guarded and protected by SSL and Ipsec. It restricts unauthorized viewers who are trying to access your documents. Plus, the SNMPv3 mechanism authenticates network devices by exchanging information with the user. This type of feature allows you to send files via a wireless or wired network without worry about unauthorized people gaining access to your confidential documents. The Fuji Xerox DocuPrint C5005 d keeps administrators notified when an error occurs during printing. Also, it comes with 16GB onboard memory to keep productivity and workflow efficient. Plus, the Run Black feature allows you to print documents fully in black when other colours run out. The Fuji Xerox DocuPrint C5005 d has a 1,200 dpi self-scanning LED chip that delivers high quality printing with LEDs as the source of light. It also offers image enhancement options for controlling the lines of sharp texts and images. Lastly, it has an EA Eco-toner which provides quality photo gloss finish on any sort of paper. 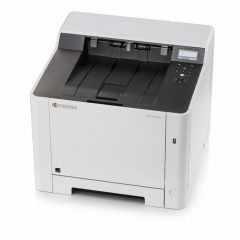 The Fuji Xerox C5005 Colour A3 Laser Printer is likely one of the best office printers you could lay your hands on so don’t hesitate and get one for your business now.